How do you know if students are with you at the beginning, middle, and end of a lesson? 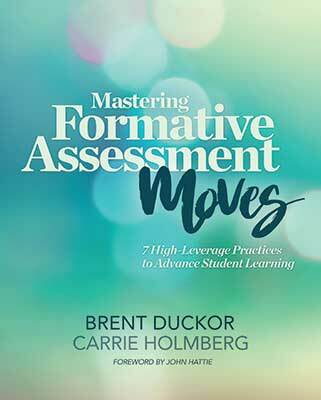 Can formative assessment offer a key to better teaching and learning during instruction? Brent Duckor and Carrie Holmberg, authors of Mastering Formative Assessment Moves: 7 High-Leverage Practices to Advance Student Learning, invite you on the journey to becoming a formative assessor, in part by focusing on seven research-based, high-leverage formative assessment "moves": priming, posing, pausing, probing, bouncing, tagging, and binning. This engaging webinar explores foundational research for each move, explaining how and when to best use it during instruction and describing what it looks like in practice with concrete examples from preservice and inservice professional learning settings. Brent Duckor is an associate professor in the Department of Teacher Education at San José State University. Duckor's research on teachers' understanding and use of formative assessment in the K–12 classroom and validation of teacher licensure exams in state, national, and international contexts seeks to integrate a developmental perspective on teachers' growth in the profession. Carrie Holmberg is a lecturer and preservice teacher educator at San José State University. In addition to supervising teacher candidates, coauthoring articles, and writing a book, she is pursuing her doctorate at San José State University in the Educational Leadership program.